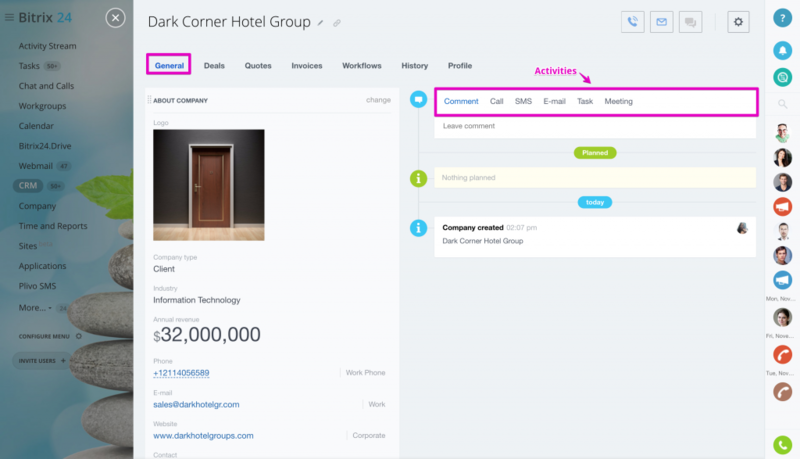 A Company is a CRM object holding data and the history of interaction with a client (or partner) company. A company is generally a large record in the CRM, since it can contain several contacts and deals, and their histories. 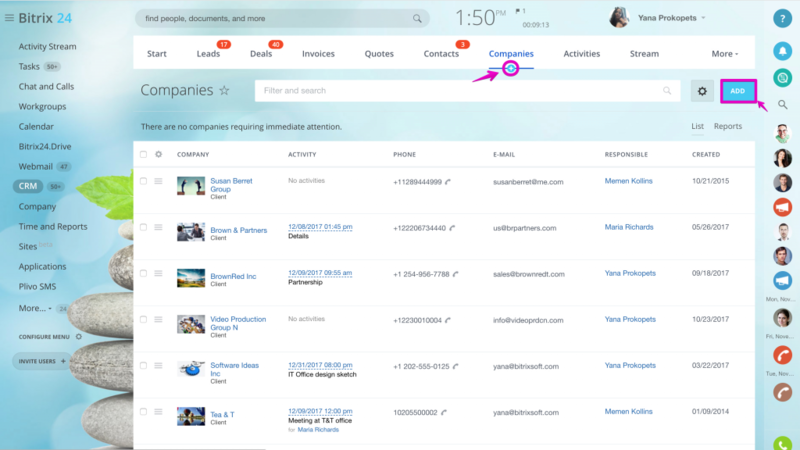 Go to CRM > Companies to add new one with the help of blue Add tab or + icon located below Companies section. 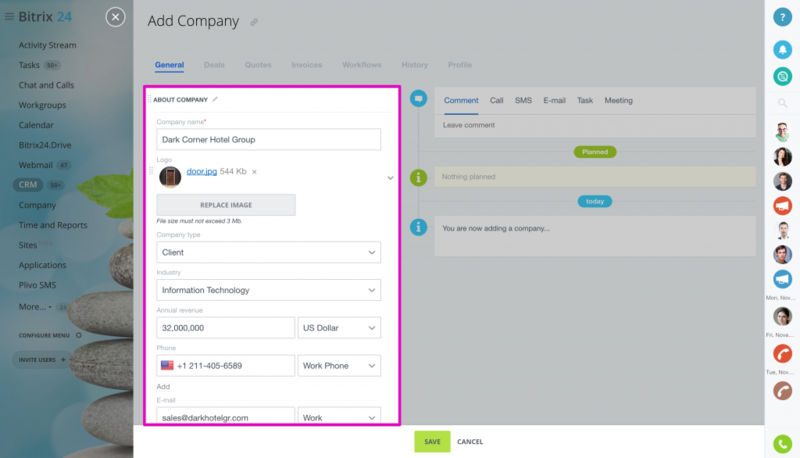 You can add new company not only fr om Companies section in the CRM, but also from new deal or new contact creation form. If you have companies list already you can also import it in CRM >Companies > Settings tab > Import Companies (more about CRM import here). A new company form will open About Company & More sections, wh ere you can add all information about the company or even create your own custom fields. Company name – the only mandatory field in the new company creation form. 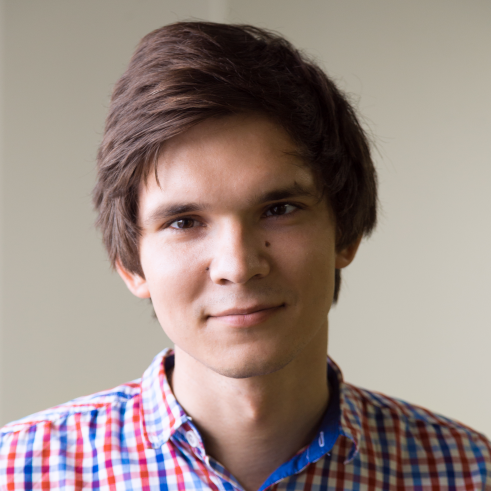 That is by default, though you can create new custom fields and make any of them required, which means a new company won’t be created until this field’s value is added\chosen. Logo - the company logo, image that will be displayed next to the CRM record name in your Bitrix24. Company type - dropdown list of company types, only one value can be selected. 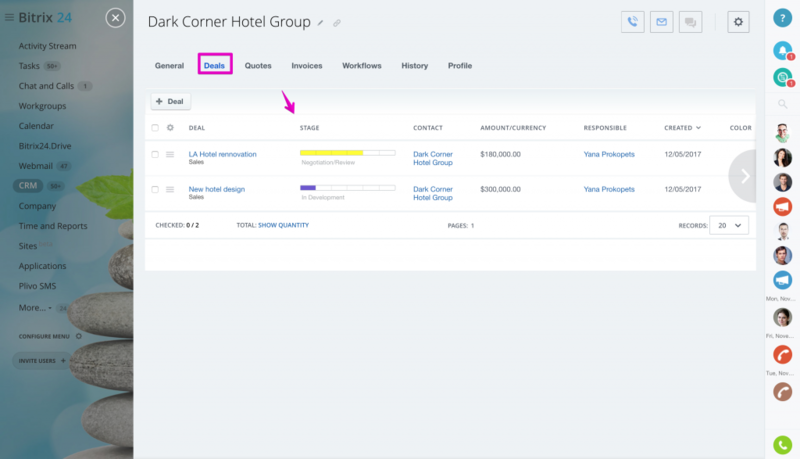 This selection list can be customized in CRM> Settings > Start point > Statuses & Dropdowns. Industry - dropdown list of industries. Annual revenue - field defining the financial value of the company. Phone, email, website - contact information. 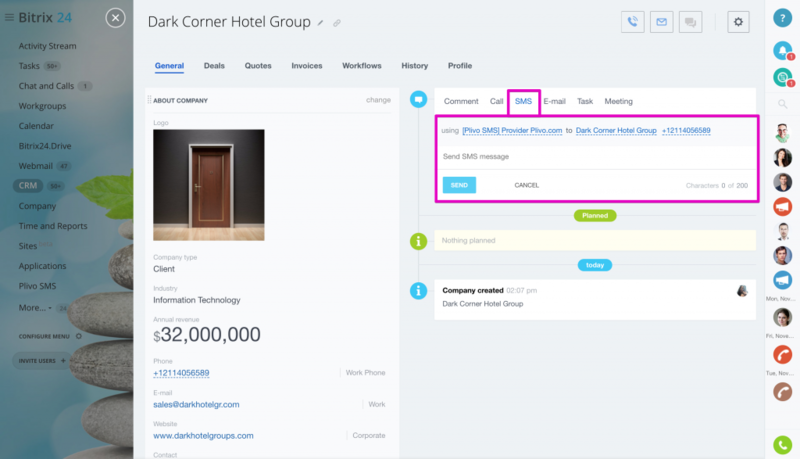 Contact - this section allows to connect your existing CRM contacts to the company or create new contacts for this company. Employees - dropdown list defining company size by the amount of employees. Responsible person - user responsible for this CRM record (only one user can be set as CRM record responsible person). By default the user who has added this company is set as record's responsible person, click on this field to change user. 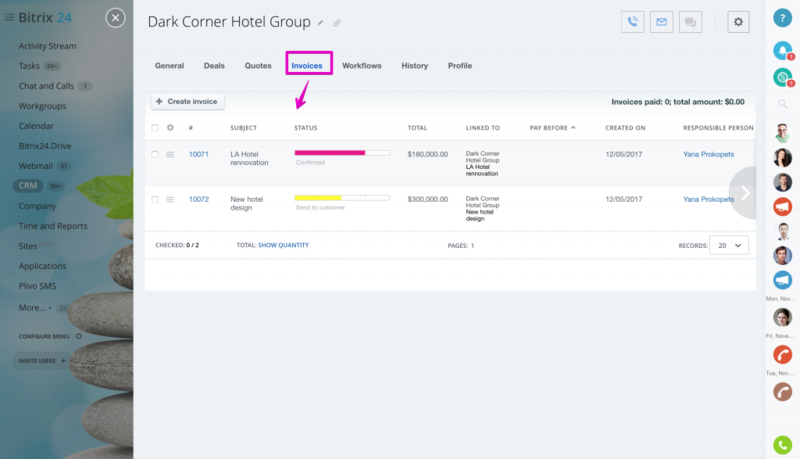 Click on Change option in the right top corner of More section to add more fields. Use Add Field option to add new custom fields. 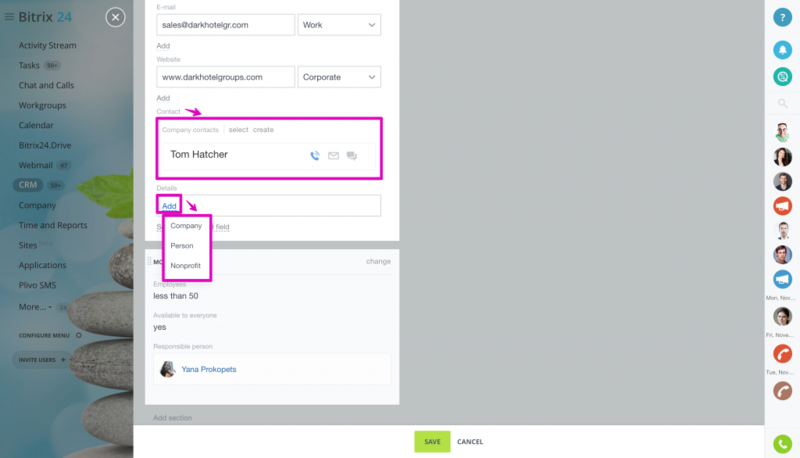 Remember you can also add custom fields from CRM > Settings > Form & Report Settings > Custom fields. 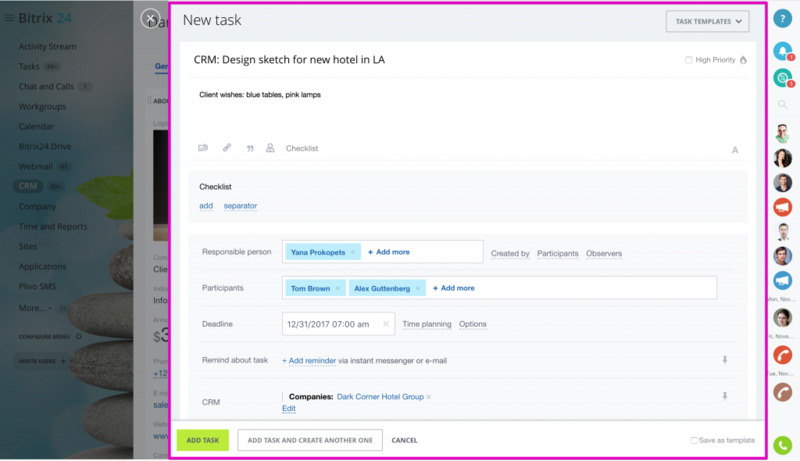 Activities block allows to plan & perform new activities and add comments. 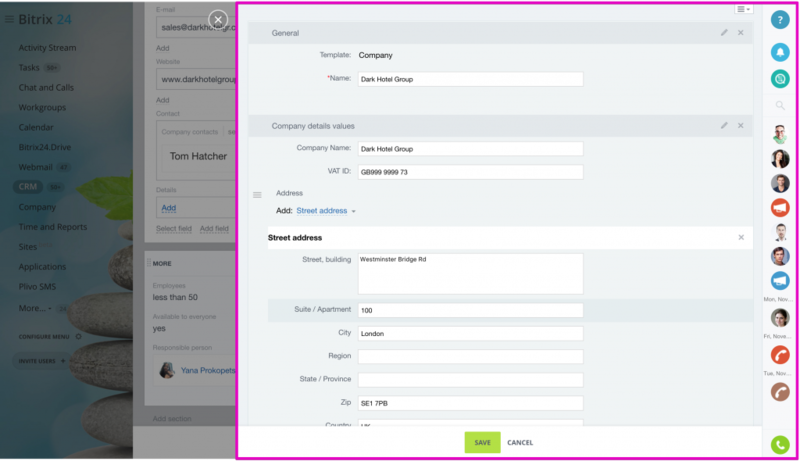 Comment - any additional information which may be useful for your sales team users. 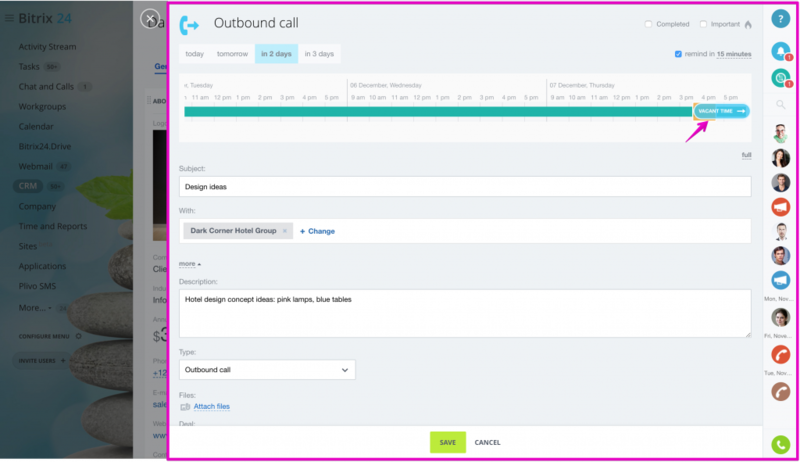 Call - schedule a call with the help of event scheduler. 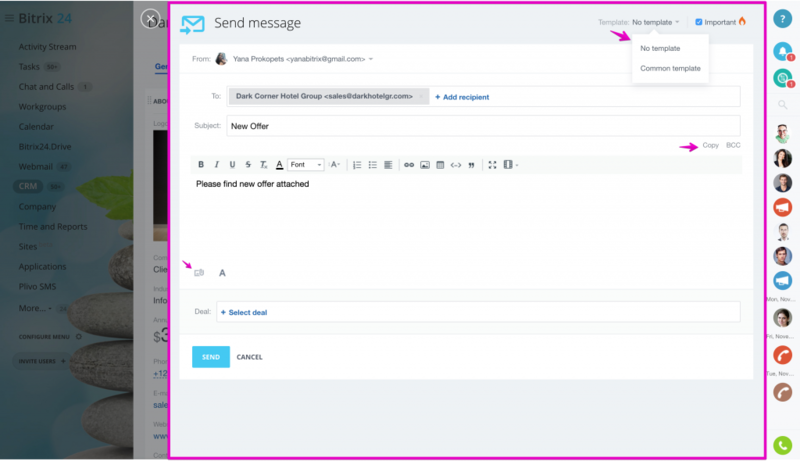 Email - send email messages to your client, email templates can be configured in CRM > Settings > Email > Email templates. Switch to Deals section to find deals connected to this company or add new ones. Deal stages, amount & responsible users will be shown as well. Switch to quotes section to add new quotes & find quotes connected to this company. Switch to invoices section to add new invoices & find invoices issued for this company. The amount of paid invoices will be shown above the invoices list. Here you can run business processes configured for companies from CRM > Settings > Automation > Business Process. Here you will find company profile - CRM record analytics.